You are here: Home / Hand Lettering / Letter A Calligraphy Practice Sheets – 8 Styles! 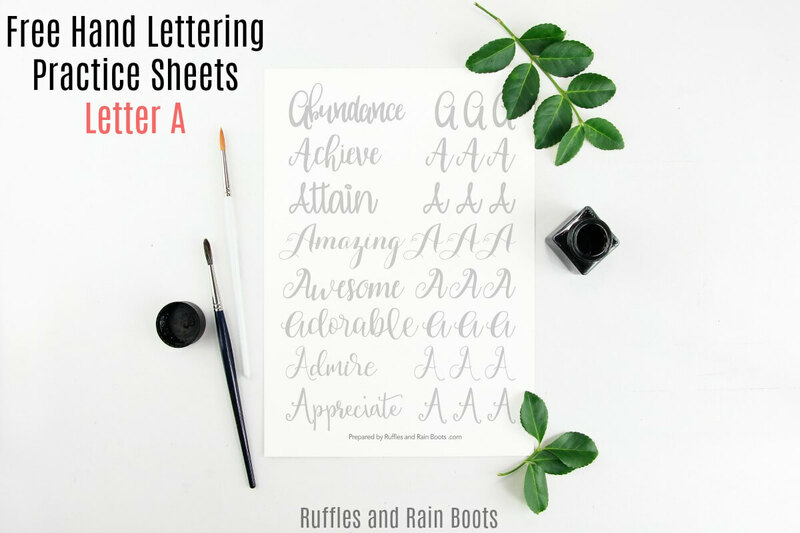 Letter A Calligraphy Practice Sheets – 8 Styles! 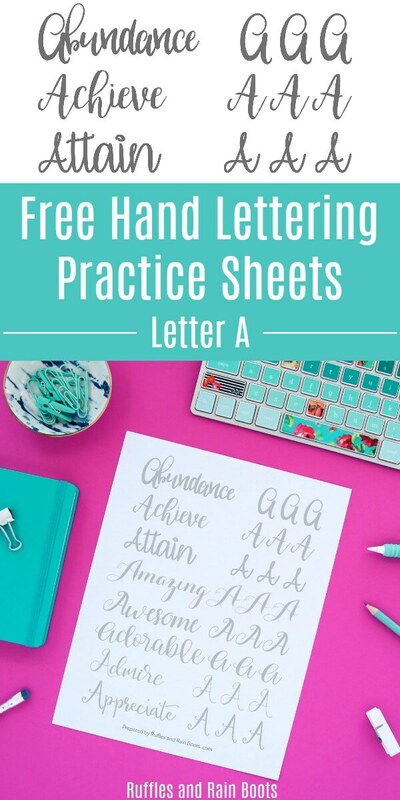 These free letter A calligraphy practice sheets will help you develop and hone your modern calligraphy, brush lettering, and bounce lettering skills! Each free set includes 8 styles to practice. Let’s get started. If you’re a beginner to hand lettering, brush lettering, or modern calligraphy, let me tell you a not-so-well-kept secret: practice, practice, practice. Just like your mom used to tell you when you suffered through piano lessons, practice is the only way to get better. use real words I would incorporate into designs. Speaking of practice, you can get the entire uppercase lettering AND the lowercase lettering sets now! Both sets include 8 lettering styles in brush, bounce, and modern hand lettering styles for large and small pen practice. I put together 8 styles which incorporate modern calligraphy letter practice along with a couple brush lettering and light bounce lettering styles. I’m a sucker for a fun, bouncy font, friends. watercolor pens (I maybe, sort of, kind of ‘borrowed’ these from my daughter). I really want you to stay connected and practice ALL of the sheets, so please sign up to get notified when I share a new set. 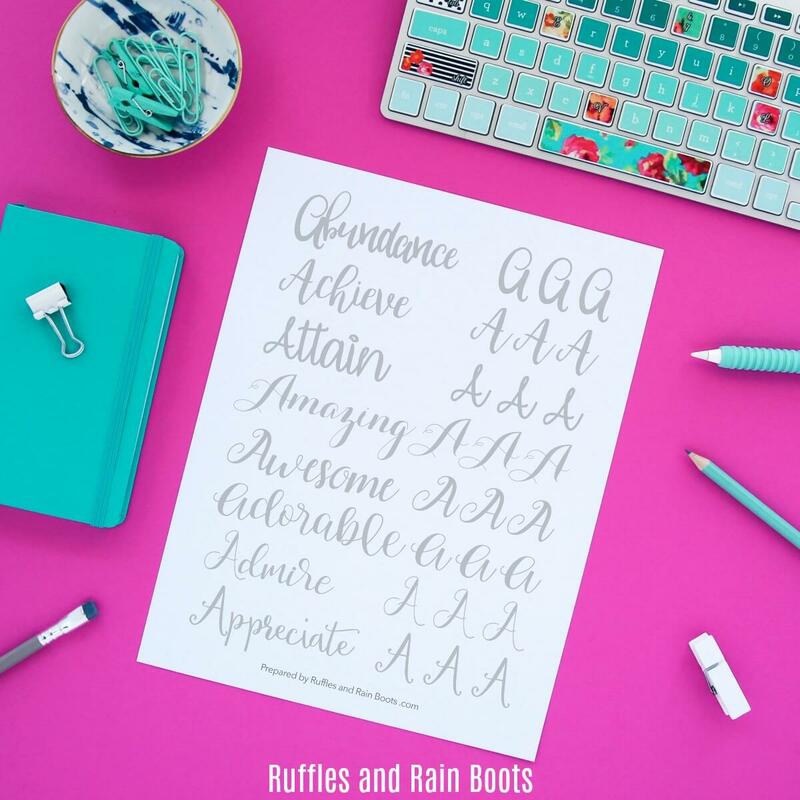 Each week, you’ll receive only one email from me sharing all the new free printables, designs, and practice sheets from Ruffles and Rain Boots. Sign up here to get the free practice sheets and a weekly update! Grab that password and then visit our Secured Hand Lettering Practice Page. Psst: you can get the entire hand lettering alphabet for capitals here! Do you have a favorite letter? How about one that you can’t get right no matter what? I sure do. Please pin this letter a calligraphy practice (or share it on Facebook) so others can improve their lettering skills, too. Your shares are how we grow and I’m sincerely grateful.